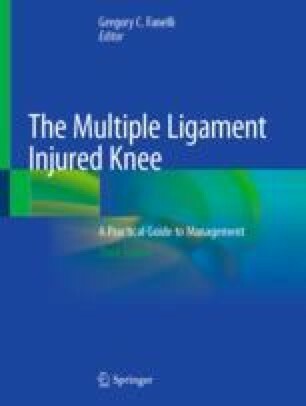 History and clinical examination are essential in the assessment of a patient with a multiligamentous knee injury. These injuries are complex and can be associated with serious limb-threatening vascular and neurologic damage. The appropriate diagnostic imaging is guided by thorough history and physical examination to enable an accurate diagnosis. A systematic approach first concerned with identifying and addressing tibiofemoral alignment and vascular injury is critical. Further classification of combined injuries in the setting of anterior cruciate ligament (ACL) tears is necessary to guide treatment options and decrease the failure of ACL reconstructions. Anterior cruciate ligament tears with lower grade medial collateral ligament (MCL) injures can be treated with bracing and delayed ACL reconstruction. Higher grade and tibial-sided MCL injuries accompanied by posteromedial corner disruption require repair or reconstruction of the medial structures to protect against chronic valgus instability. Acute combined ACL and lateral-sided injuries are best treated by addressing the lateral collateral ligament (LCL) and posterolateral corner (PLC) injures surgically in conjunction with ACL reconstruction. Chronic ACL and PLC injuries along with acute midsubstance LCL and higher grade PLC disruption have led to poor outcomes without anatomic reconstruction. The orthopedic surgeon must consider acuity, comorbid conditions, pre-injury physical demands, current structural damage, vascular and soft tissue status to determine the appropriate timing, technique, and extent of surgical intervention.